Time to start your fall vegetable garden?! But wait it’s still summer! OMG! I’ve received newsletters already talking about starting our fall vegetable gardens! What?! Already?! I’ve barely harvested my spring garden and haven’t harvested the summer garden yet!! No! No! No! 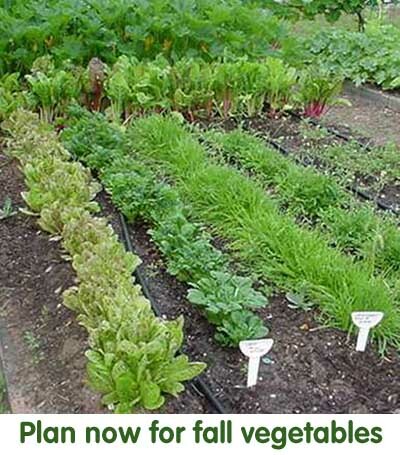 Yes folks, it is time for us to consider planting our fall vegetable gardens mid-month. The fall garden is very similar to the spring gardens in the varieties of veggies we can grow. If you want lettuce, chard, kale, spinach and many of the cool season crops later in the fall, you should consider putting them in this month. I would either plant seeds inside under lights to transplant later or buy seedlings at the nursery (that way you can plant a little later). Just make sure you buy heat-resistant varieties of lettuce and spinach and give them some shade for now. If you plant by seed, most lettuces take around 60 days till fully mature which would put us in September-October. Hard to believe isn’t it? To figure out when to plant each variety, just look on your packet of seeds and count backwards from the time of the FIRST AVERAGE HARD FROST (Oct.3 in Santa Fe ) and add 14 days for shorter daylight hours (I add 15 days to make the math easier for my memory). So if I have some lettuce that will take 60 days till harvest and I add the extra 15 days, that would bring me 75 days (2 1/2 months) ahead to plant before a hard frost. So if I plant on July 15th, I would harvest right around Oct. 1. Unbelievable! Now with spinach and kale you can wait a little longer as they can handle some frost. And if you want some in Sept. you better plant now-like this weekend! Just when you thought you could cruise till summer harvest! This entry was posted in GARDEN PLANNING, general and tagged fall vegetable gardening, growing vegetables in the high Southwest, home gardening, kitchen garden, lettuce, planning fall vegetable gardens, spinach, vegetable gardening. I am finishing harvesting in the greenhouse today and was wondering what to plant at this date, so this email was really timely.